We Were Woodwards: Mountain Pine Beatle Ravaging North American Forests! Mountain Pine Beatle Ravaging North American Forests! The Mountain Pine Beetle is out of control - we saw these brown lodgepole pines all over the Rocky Mountains last summer! Usually, cold snaps of 2 weeks in duration below zero kills the Pine Beetle each winter and prevents them from getting a foothold in pine forests. Yet, now there is massive global warning and these beetles have eaten nearly 25% of all of the Lodgepole Pines in all of the western USA and 13% in Alaska. It's like a massive wildfire of beetles. Even worse, loggers cannot use the dead pines after they have been consume by the beetles - what can be done? Few stories rival British Columbia's near-epic battle with mountain pine beetle. Under BC's 2006-2011 Mountain Pine Beetle Action Plan, efforts are now underway to harvest and use the wood of trees affected by MPB, and economic strategies are in development to stabilize communities in the longer term. The BC First Nations Leadership Council and the Cariboo-Chilcotin Beetle Action Coalition (CCBAC) are two coalitions tackling economic, social, and conservation issues. FORREX (www.forrex.org) has worked with the forest industry on management practices and operations, hydrological issues, ecosystem restoration and harvesting strategies. 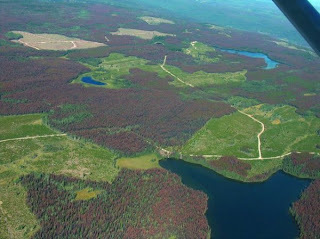 PHOTO: MPB-affected forest (red-brown area) near 100 Mile House, Cariboo-Chilcotin.